A team of members from the North Jersey Clergy Fellowship CDC, Everlasting Life Foundation Ministry, Tierra Madres, Muture Sisters and the Bergen Community College NAACP have been working with Ivan Wei and next-door neighbors the Rodriguez family to create the Passaic River Garden at 108 E. Holsman Street in Paterson. Cleanups have been done, some raised beds are made and planted, and the community is welcome to come by and enjoy sitting or helping in the garden and learning about urban growing. Soon, we’ll set up collection times for vegetable scraps to be brought by and donated to our compost area and we’ll invite the community to celebrate the garden’s creation with us. This community garden features milkweed to feed and protect butterflies supplied by Monarch Watch, vegetables and raspberry bushes planted in square 4’x4′ raised beds and in 8’x2′ beds specially designed for vertical growing along an existing fence. We are completing the grapevine arbor which will provide both edible fruit and a pleasantly shaded spot for sitting under. And, we have water donated by the Rodriguez family as well as a 250 gallon tank for backup. 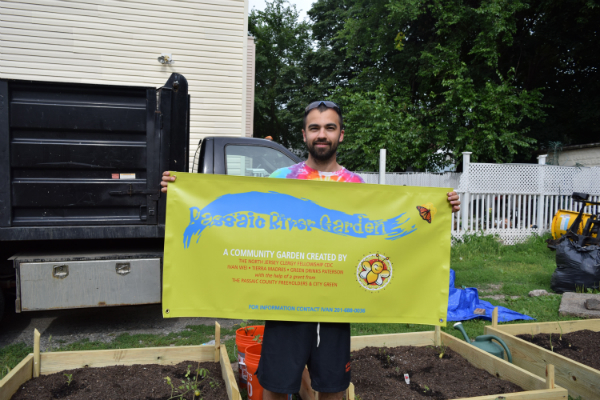 We thank City Green and the Passaic County Freeholders for helping to fund the garden and members of St. Augustine Presbyterian Church of Paterson for their continuing enthusiastic support and encouragement. Here are some before and during construction fotos. Later today we’ll post more: our sign hung on site, planted boxes and pix of how the arbor and benches are coming along. If you have questions or would like to help or support the garden in any way please contact Ivan Wei 201-688-0036 or email Tierra Madres.